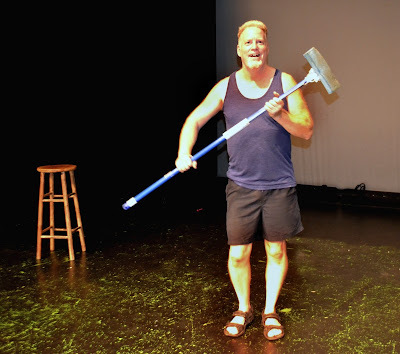 Favorite Credits: Acting - The Cleaning Guy, Directing: Sister's Dance, Real Danger; Producing: every play we have done at Emerging Artists in the last 23 years. Why theater? : My father wanted me to be lawyer, but I wanted something where I could reach people in a larger and more human way. Tell us about The Cleaning Guy? : This is one man's journey from a job that started out to pay the bills but evolved into something more where the job became a social involvement to help people get their lives together. What inspired you to write The Cleaning Guy? : I have been cleaning apartments in New York City for over 25 years and I thought that it would be unique to give an audience a voyeuristic view of what goes on behind people's doors and how significant the job can be to certain people's lives. What kind of theater speaks to you? What or who inspires you as an artist? : I love theatre that engages me and takes me on a journey where I forget about the rest of my life and am immersed in new situations that grab my attention and let's me ride it till the end. I am inspired by the amazing creativity that lies in all artists and how they can bring that to the page to share with an audience. Who would play you in a movie about yourself and what would it be called? : Don't know and "How Does He Have so Much Energy"